Posted by mwidlake in Oracle Scene, UKOUG, User Groups, writing. For the last couple of years I’ve been involved in “Oracle Scene”, the UKOUG magazine about all things Oracle. Click the link to see the current edition, which is free to view to everyone, member of the UKOUG or not. I first became involved by writing an article for Oracle Scene. In fact it was the first thing I’d written that was published by a third party. This led to me helping with content selection and then content sourcing and, before you knew it, I was deputy editor for Tech content – helping out the main Editor, Brendan Tierney. We were soon joined by Toby Price as deputy editor for Apps content and the three of us were aided and assisted by first Brigit Wells and then Karen Smith from the UKOUG office. I’ve really enjoyed helping put together the 5 or 6 issues I’ve been involved in. As a deputy editor I help source content (i.e. hassle people to submit articles), take the feedback from the content review committee, help make the final choice of the articles (with of course a focus on the tech ones) and together we decide on the running order in the magazine and which articles get mentioned on the front cover. I’ve also helped copy edit a few articles, especially those written by people for whom English is not their first language. I find it somewhat amusing that I do this as I am dyslexic. However, the professional layout company we use pick up on the spelling errors I miss (or introduce!). I also hunt down and remove all incorrect uses of the term “premise” and American spellings where it is not a technical term (did I mention my OCD tendencies too?). For the previous issue (Autumn 2016) I took on most of the role as editor as Brendan was busy with his day job. That is one of the nice things about having a small team, you can cover for each other but it does not become “decision by committee”, which I am not at all a fan of. However with some recent changes outside my Oracle community life (nothing bad, just changes) it’s time for me to take off some of my community hats, especially those that need a constant, regular input. So I’m having to hang up the OS deputy chair one. 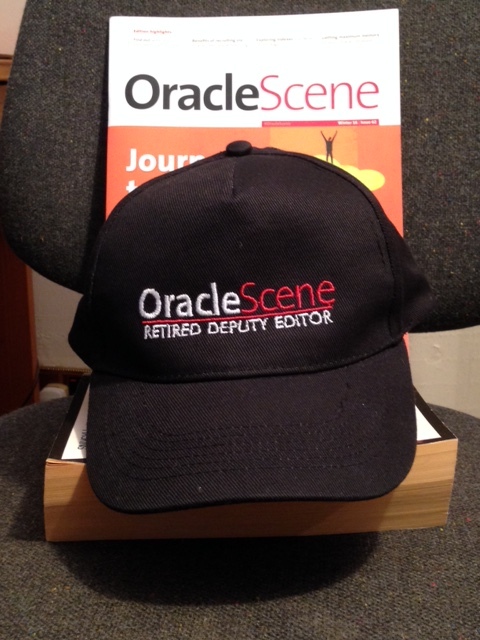 But to my delight, at the UKOUG Volunteers drinks at the annual conference, Karen, Toby and Brendan presented me with an “Oracle Scene retired deputy editor” baseball cap, which was really nice of them. So I take off a virtual hat and get to put on a real one. I still intend to submit articles to Oracle Scene and I’d encourage all of you to consider doing so. It is one of the very few publications in the Oracle arena that is still physically printed as well as published electronically. You can get copies at any UKOUG event and there are usually some in each UK Oracle office. And if you are in the UK (or very close by) and would like to be involved in a small but fun team, ask me (or any of the OS team) about becoming a deputy editor for Oracle Scene. And guys, thanks once again for the hat and the fun we have had doing this.